Ushio and Tora character bios page! Enjoy! Ushio Aotski: a young school boy who falls into a pit in his family's temple, only to free a monster and gain the powers of the Beast Spear. Easy to anger and quite impulsive in his actions, this boy soon finds himself fighting demons and monsters and other creatures of darkness. With his reluctant monster partner, Tora, Ushio protects his friends and makes new ones in his many journeys. Tora: An ancient tiger monster who had been trapped for 500 years in the Aotski temple and was released from his prison by Ushio. After trying to kill him, several times, they came to reluctant truce in which the beast was forced to help the new demon hunter fight a horde of fish monsters. The boy stopped him from leaving, because the monster's evil energy was still attracting monsters. It was then that Ushio decided to name him 'Tora' because he looked like a tiger, much to the beast's humiliation. 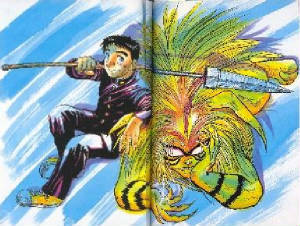 Tora constantly tries to kill Ushio, until the boy saves him from another demon hunter named Hyou in the second video. He then decides not to kill him for a while, but still claims that Ushio is his meal. 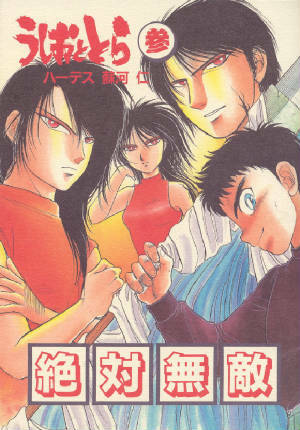 Thus, causing many more friendly fights between them throughout the series and manga. In the fourth video, it is revealed that Tora is actually Lord Nagatobimaru, though he hates the name because Ushio's ancestor trapped him when he was still using that title. Beast Spear: (also known as the Kemono no yari, Animal Lance, or Bakemono Yari, the Beast Spear) Although it isn't a real character, it is said that three souls are still inside it. Two brothers and a sister, I believe. It was made in China over 2000 years ago, it's only purpose, to kill monsters. It bonds with its master using the power of the human soul. 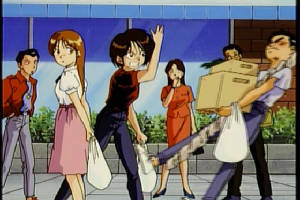 Asako Nakamura: a hotheaded tomboy who is friends with Ushio. There is a little suggested thing between them in the series. Ushio saves her life many times even though she doesn't realize it. The pair are best friends despite their constant arguing and her father's attempts to get them on a date. She's brave and loyal, always willing to risk her own life to save someone else. She also doesn't find out about Tora until the manga, which means that she thinks Ushio is nuts everytime he seems to talk or fight with himself or some invisible creature. Mayuko Inoue: Asako's other best friend who hangs around her and Ushio all the time. A sweet feminine girl, despite not really being interested in accessories, who is smiling through the darkness. Her own ancestor was a psycic woman who trapped five demon heads long ago. In the third video they were released and reaked havok trying to kill her, but she was saved by Tora in the end. She was the first person to offer him a hamburger, even though he was more interested in eating her, thus coming upon the nickname of 'Hamburger girl' to Tora. Shigure: Ushio's father and the priest of the Aotski temple. At first glance, he seems to be a typical monk interested in raising his son to follow in his footsteps. Unfortunately for him, Ushio was not interested in the old legends... at least, not until he met Tora. Hyou: Also known as Hyo. Aseal magician with only one eye. The other eye (right) is blue (fake, sign of a seal magician, I think) and has three long scars over it. A monster that looked like Tora killed his wife and child daughter, resulting in a thirst for revenge against all monsters, the same one who scarred him. Ushio saved Tora's life and made Hyou realize that he it wasn't revenge it was just murder. He used a KIN attack, which means 'to prohibit the abilities.' To use it against a monster prohibits their existance. Lady Mikado Hizaki: a powerful psycic of the Meiji era. She disappeared after banishing the Gamin at Shirazu-Zaka in Shizazu-Cho. Rashin, Juro, and Karani: Three wind weasel demon siblings. The trips the human, the second cuts them, the third puts medicine on the cut and bandages it. After having humans constantly destroy their homes, the most peaceful of the three, Juro, who also happens to be the fastest because he is the one that cuts, went on a killing spree for revenge. Ushio fought him and nearly died, but fought him again and cried for Juro, making the demon realize what wrong he had done. In the end, Juro threw himself on the spear and died, leaving his siblings and Ushio to grieve his death. Izuna: (my personal name for him, since I can't read Japanese, was Kyo before I found his real name). A small ferret creature who meets up with Ushio on his travels. Umizato: Man of the Sea, appears in the fourth video asking for Tora / LN's help to defeat Ayakeshi. Gamin: (also known as the Barbaric Flying Heads tribe) From the third video. Monsters that Lady Mikado Hizaki trapped using the Rivet Stone, a five pointed stone with each point impaling a wooden box. Inside each box was a monster, five heads, that now have bleeding holes in the middle of their forheads from rock. When they were released, they went on a killing spree as they tried to eat Muyuko for revenge. Tora saved her life and she gave him a hamburger in return. Ayakashi: A great sea monster from video four. It was created by the gathering together of all the souls of humans who died at sea. It ate humans and monsters. Tora and Asako and Tatsuya get swallowed up by it. Ushio jumps down it's throat to save them. In the end, it explodes (because of beast spear and lightning) and releases the souls back into the heavens. WhiteFace: The ultimate enemy in the Ushio and Tora series. (also known as the Mask White woman, if it's translating correctly).